Caring for chickens is not nearly as complicated as you may think. Have you wanted your own source of fresh, healthy eggs, but were intimidated at the prospect of keeping a flock of hens? Or perhaps you live in the city and weren't even sure if you could keep a flock of hens? Here's the good news: almost anyone can keep chickens, and their needs are simple, especially if you keep your flock in a chicken tractor. Chickens are one of the easiest ways to pursue self-sufficient living. So follow these maintenance tips and your flock will remain contented, strong and good egg producers and provide healthy homegrown meat. Whether you keep your flock in a stationary coop, or a chicken tractor you will need to protect your flock from the wind and sun. A roof is especially important when caring for chickens. Your birds will need shade during the hot summer days or they could go into early molt and stop laying, so be sure to provide your birds with protection. While their dwelling space should be well ventilated, there also should be some protection from wind, especially during winter, when the north wind is particularly cold. 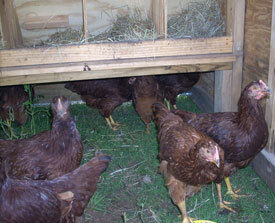 Your hens will need nests to encourage them to lay eggs in the coop. 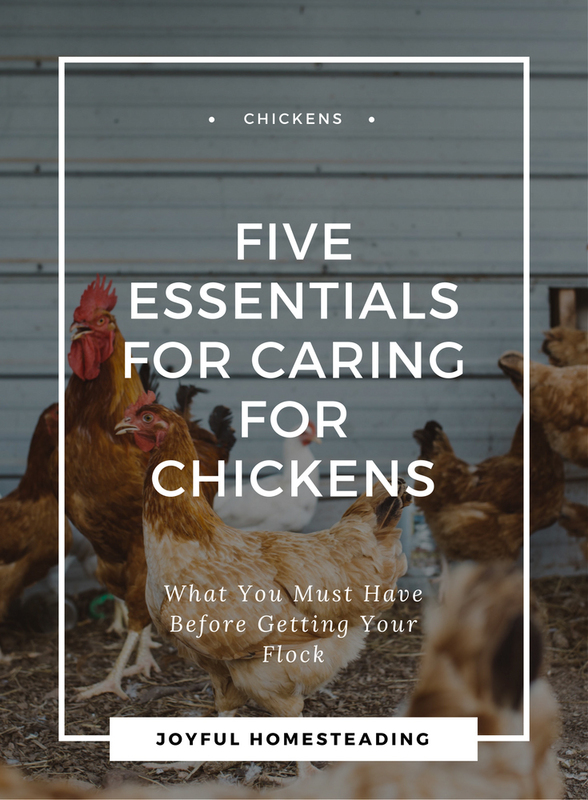 A good rule of thumb when caring for chickens is one nest for every two birds. Line the nests with clean straw, replacing it often. Throw the dirty straw in your compost pile. It will produce great soil for your organic garden. Because you will be in and out of your coop or tractor periodically, you will need it to be big enough for you to get inside easily. If you plan on keeping your chickens in a stationary coop, provide your chickens with a dust bath. 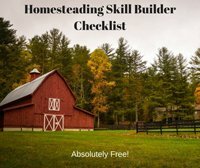 Fill a washtub with diatomaceous earth and set it inside the coop. You will need to protect your flock from predators, especially dogs, who tend to love killing birds. A good solution is a portable electric fence surrounding your coop. 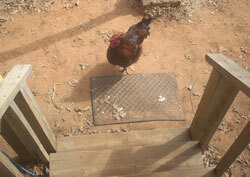 Also, make certain the door to the coop can be latched shut to keep out unwanted guests. Make certain your birds have adequate space. 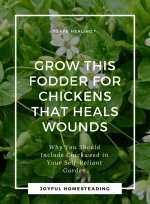 Provide three square feet per bird when caring for chickens. Provide these simple maintenance precautions and you're on your way to a healthy flock. You'll want your chickens to get the best diet they can, something that will be a challenge when caring for chickens confined in a coop. Of course, if you want your birds to get the best nutrition possible, keep them on grass in a chicken tractor . That way they'll get a daily diet of fresh greens and insects and produce healthy meat as well as great eggs. However, the greens usually won't be enough for a healthy maintenance, so you'll need to give your flock rations as well. To make sure they get their complete nutritional needs met, buy commercial rations for them. You can purchase feed from your local feed store. The type of ration you buy will depend on the age of your flock and the breed of your chicken. Most farm supply stores will sell chick ration (for the first ten weeks of your flock's life); broiler ration (both grower and finisher); pullet ration, both grower and developer for your female birds; lay ration for your laying hens and scratch grains, a bit like candy to your flock. Free-choice feeding - where you leave rations out all the time - is a simple way of caring for chickens and making sure your flock is getting enough to eat. 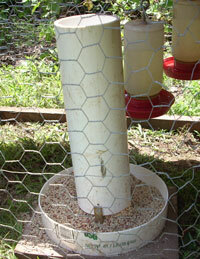 A large tube feeder is easier to use; you only have to fill it once a day. Plus adding probiotics to their diet on a regular basis will keep your flock healthy and strong. If you keep your chickens in a coop, the end result will start piling up and getting higher by the day! It's not healthy for anyone to live in their own manure, and your birds are no exception. So an important part of chicken care is to remove that manure on a regular basis, and add it to your compost pile. They'll appreciate the maintenance. Also scrub their waterers once a week and clean their feeders. If you have a stationary coop it is especially important to clean it out periodically, but any perches you have in your chicken tractor should also be cleaned on a regular basis along with the nest boxes and any place where chicken manure is likely to pile up. 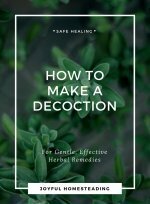 By the way, you should let the manure age for at least two weeks before adding it to your organic garden. Otherwise the fertilizer will be too strong and will burn your plants. Other birds can bring diseases to your flock, so keeping them away is one of the best ways of caring for chickens. Even if these birds look healthy, they may not be. If you get a new bird from somewhere, isolate her for two weeks to make sure she is healthy. Also, keep other poultry lovers away from your flock. They could spread diseases with their shoes. Don't mix birds of different ages or species as they could spread disease as well. And finally, keep wild birds away from your flock. They can bring in parasites, along with the dreaded avian flu. Spend any time at all caring for chickens, and you'll realize they tend to panic easily. Today, one of our roosters got out of his pen and got chased by our dogs. He was so terrified he fainted dead away! Hence, the term "chicken-hearted." It won't take much to stress out your birds, but stress is not good for anyone, and especially not for your flock. To keep things calm, talk gently or sing to your hens and roosters whenever you get near, and always handle your birds gently. 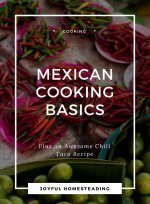 Want to learn how to butcher your chickens? Read this article.